I seem to be dealing a little better with my growing baby. I’ve come to terms that each month he gets older and learns new things. It seemed like this month he got bigger and turned into more of what I imagine a 6 or 7 month old to be. He seems more solid. He seems more robust. It must be because he wants to sit up from a laying position. He rolls over to his side to grab a stuffed animal. He squeals like he might not ever be able to do it again. He smiles at whoever talks to him. He laughs if someone or something is funny; mostly if you’re doing something to him. He turns his head when someone walks into the room. He sticks his hands out to touch Wrigley. He reaches out and grabs toys from your hands. He’s never is the same spot in his crib the next morning. Most of the time he’s not facing the same direction! 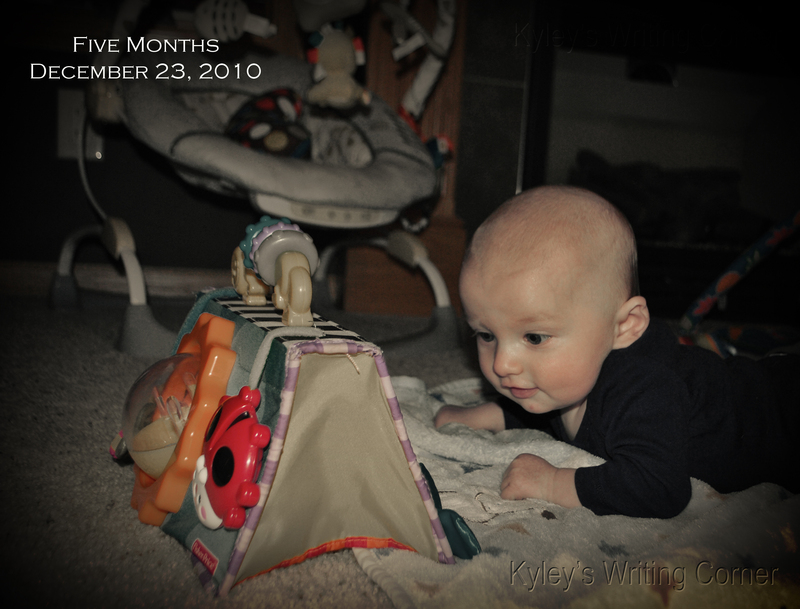 Rolled over for the first time on December 26 – awesome Christmas gift! He’s only done it a couple of times since. Reaching out and touching or grabbing things. Playing in his bounce-a-bout in a standing support system. Another month has come and gone. It feels like Maximus has always been here and I’m thankful every day for the live I have.